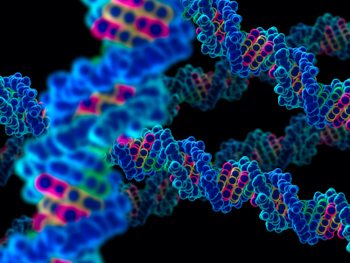 One of the greatest advances in the biomedical sciences has been the unravelling of our genetic code. This new understanding sheds light on what makes organisms function and how they are related to each other, helps to combat diseases, and to convict criminals. But it also poses great mathematical challenges: the genetic revolution is an information explosion which can only be tamed using mathematical methods. This package brings you lots of information on how mathematicians have helped to meet this challenge. The articles listed below explore the role of maths and statistics in unravelling genomes, understanding our ancestry, fighting disease and using DNA evidence in court. If you're a teacher, you might want to explore a statistical problem surrounding the use of DNA evidence in court with our classroom activity. And if you're a student thinking about your future career, have a look at our career interview with a genetic scientist. This package is part of a series on the role of maths and stats in the biomedical sciences, produced with generous support from the Wellcome Trust. The human genome is represented by a sequence of 3 billion As, Cs, Gs, and Ts. With such large numbers, sequencing the entire genome of a complex organism isn't just a challenge in biochemistry. It's a logistical nightmare which can only be solved with clever algorithms. Read more.. Influenza virus: it's all in the packaging!